You probably tape up your own webcam. That’s just good, if a little paranoid, personal security. Others don’t tape up their webcams. In fact they want you watching them and visiting locales you might never get to visit, or viewing vistas you haven’t seen in a decade. So sit back, chill out, and tune into these spectacular real-time sights, all from the comfort of your computer. There’s a reason Sydney Opera House rarely survives an alien invasion in films. There are few sights in the world more iconic than this shot of the opera house, taken from across the harbor from the Rocks part of the city. If you want a different view of the Sydney Opera House or Harbour Bridge, there are several other webcams to try. You get a choice of different views from the webcams in Yosemite National Park, but we like this one of the Half Dome. If you’re visiting the park you can get a heads up on weather conditions, and if you’re not you can still gawp in wonder at the natural beauty on display. Take a look at the picturesque floating city before it’s completely submerged under water. This view shows you the hustle and bustle of the pier with the entrance to St Mark’s Square in the background. If you prefer a look at one of the canals and the Rialto Bridge then we can give you that too. If you’re interested in taking in some natural beauty and perhaps doing some monster-spotting at the same time, then the webcams around Loch Ness in Scotland offer a great opportunity. Don’t forget to have that screenshot button handy. Knowing the weather conditions is essential for skiers and snowboarders, so a quick web search is enough to bring up cams in pretty much any resort in the world. We’ve picked a webcam from the stunning Jungfrau part of the Alps in Switzerland, home to the Eiger. 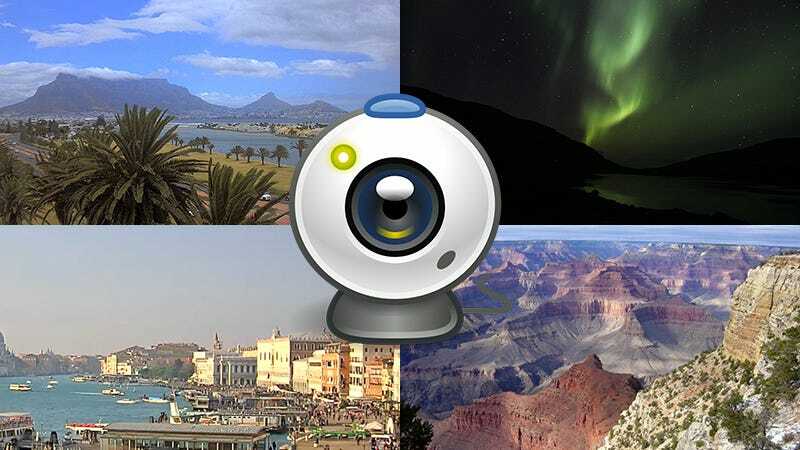 There are many different spots around the world to catch a glimpse of the Northern Lights or Aurora Borealis, and if you can’t make any of the trips yourself then a webcam is your next best option. You have to time it right though, otherwise the feeds can be a little dull. There are plenty of webcams dotted around New York, as you would expect, for those of you who prefer man-made wonders to natural ones. Some of the best feeds from the Big Apple focus on Times Square, though you’ve just missed the New Year celebrations. Some breathtaking Scandinavian scenery is available through the Lysefjord webcam, running around the clock as a live stream on YouTube. Unlike a lot of webcams, the view is constantly changing, which means there’s always something different to look at. Earthly sights don’t come much more spectacular than the Niagara Falls, which straddle the border between the US and Canada, and again there are a choice of webcams and views to pick from. A more interesting watch during daylight hours, for obvious reasons. An eye-catching view of one of South Africa’s most well-known natural attractions, this webcam feed has a wide enough angle for you to be able to take in a lot more besides Table Mountain itself. It’s almost like standing on the balcony of a Cape Town hotel. With towering cliffs and spectacular vistas, Milford Sound (or a webcam showing it) is the perfect spot for acting out some of your Lord of the Rings fantasies or pretending you’re a billionaire prepping for the apocalypse. Of course getting to New Zealand from almost anywhere is a long trek, which is where a webcam can help. Another US National Park with excellent webcam coverage. Tuning into a feed of the Grand Canyon isn’t quite enough to give you a full idea of its scale and scope, but it’s a fantastic watch nevertheless—provided the whole scene isn’t blanketed in a layer of fog. Which is why you should maybe avoid tuning in too early in the morning. One of the most picturesque cities in South America is well covered by webcams, so you can choose your view and take in the whole of Rio remotely, thanks to your web browser. Here we’re looking at Copacabana Beach, which carries on for more than two miles. It’s so pretty you can forget all the sewage those people might be swimming near. One of the best views of one of the most significant religious pilgrimage landmarks in the world. Avoid the crowds and keep the dust off your feet by watching the day go by at the Basilica via webcam, and if you feel like you need to change the view, use another feed. Not the world’s most famous tourist spot, but in recent times the internet has been going crazy for the feed coming from this tiny town in the western US. It must be something to do with the tranquility or the simplicity. Or maybe people just really love a good archway. Another important part of the world for religious pilgrims and a scene that’s recognized the world over. This webcam, like some of the others we’ve mentioned, can be panned and zoomed through your browser, if there’s a particular detail you want to check out.